ALBANY, N.Y. — A group known as “Concerned Clergy for Choice” and others recently gathered in the New York state capital to advocate for access to abortion and contraception, and to express support for the sexually-centered organization Planned Parenthood. The group, which is a program of Planned Parenthood Empire State Acts, includes Presbyterian, Methodist, Episcopalian, American Baptist and Unitarian clergy members. Also present at the event was Sara Hutchinson Ratcliff of Catholics for Choice, who asserted that many Catholics differ with their leaders on the issue of abortion. “Regardless of what the Catholic bishops may tell policymakers, the great majority of the faithful in the Catholic church disagree with our hierarchy about issues of abortion, contraception, and where and how the proper role of religious voices in public policy should be,” she said. 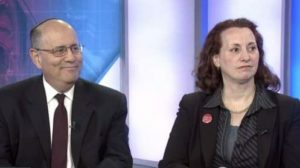 The two additionally appeared on the statewide talk show “Capital Tonight,” where they stated that they are concerned about the consequences of repealing Obamacare and claimed that many religious persons support the provision of contraception and abortion. “I am hearing from my faithful, ‘Where am I going to get my birth control if something happens in Washington?’ I’m hearing from my faithful, ‘Planned Parenthood was there for me decades ago when I needed them and I want it there for women today,'” Ross also said. In light of the activism of Concerned Clergy for Choice and Catholics for Choice, the group New Yorkers for Constitutional Freedoms, which lobbies for pro-life and pro-family causes, urged Bible-believing pastors not to be silent and allow the liberal voices to take over. “There is nothing unprecedented about the efforts made by Concerned Clergy for Choice to push public policy in the wrong direction in Albany; this group has been active for years. There is, however, an important question that true Christians should ask in response to this news: How many Bible-preaching pastors are visiting the capitol to share the Gospel and speak out for the sanctity of life?” it asked. According to AbortionWiki, as of 2012, members of Concerned Clergy for Choice included Paula Gravelle of Schenectady, a Lutheran; Jeremy Lopez of Tonawanda, from the United Church of Christ; Rich Rose of Ithaca, an American Baptist; Anne Wichelns of Evans Mills, an Episcopalian; Kaaren Anderson of Rochester, a Unitarian Universalist; Linda Henry Goodman of Brooklyn, from Reformed Judaism; and Laurena Marie Wickham Will of Ogdensburg, from the Presbyterian Church USA.